ChemDry Clean & Fresh Professional Carpet Cleaners in the Castle Hill District provide customers with an honest & friendly service with no hidden charges or fees. Why Use ChemDry Clean & Fresh Castle Hill? We offer a premium quality cleaning package (including Castle Hill rug cleaning and Castle Hill upholstery cleaning) that is green certified and quick drying. Our quotations are free (either online or by calling) and our Carpet & Upholstery cleaning service is guaranteed. Another selling point is our competitive prices. You won’t get this exceptional service anywhere else for such an affordable rate. If you’re looking for the best carpet cleaning in the Castle Hill and surrounding areas, then look no further. ​Whether it's stains, bacterial, allergen issues or a deep healthy clean needed, we relish the most challenging problems. From super yachts, private jets, commercial or residential needs you'llbe delighted by our results. 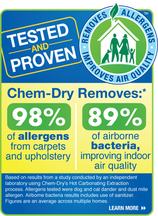 ​Don't be fooled by other inferior cleaning processes, see why ChemDry’s unique method has made us the world’s most popular carpet & upholstery cleaning company. Whether it’s your school, home or business we can reduce health problems like allergies by thoroughly eliminating dirt, mites, dust and odours.